After coming off a national championship year, four Auburn football players find themselves in trouble with the law. Mike McNeil, Shaun Kitchens, Antonio Goodwin and Dakota Mosley were all arrested Friday morning in Auburn, Ala.; police say the men entered a house and stole property. The football players were charged with robbery, burglary and theft and were released on bond earlier this afternoon. It didn’t take long after the arrests for Auburn head coach Gene Chizik to issue a statement dismissing them from the team permanently. 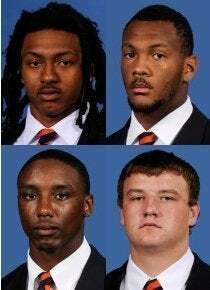 Auburn coach Gene Chizik issued a statement saying all four players were thrown off the team. "The players arrested in connection with this deeply troubling incident have been permanently dismissed from our football team," Chizik said in a statement. "While we realize the legal process will run its course and these young men have a right for their case to be heard, playing for Auburn University is an honor and a privilege. It is not a right." Auburn athletics director Jay Jacobs said in a statement: "This type of behavior will not be tolerated at Auburn. I fully support Coach Chizik's swift and decisive action to dismiss these four student-athletes from our football team effective immediately." Goodwin, Kitchens and Mosley all were part of the 2010 signing class ranked No. 4 in the nation by ESPNU Recruiting. Mosley redshirted last season. Goodwin and Kitchens played primarily on special teams.